The new flagship of the sea. Other photos: Saloon, Saloon, Saloon, Saloon, Pilothouse, Pilot house, Galley, Galley, Master cabin, Guest Cabin, ViP cabin, Head, Photo 13, Flybridge, Flybridge, Flybridge, Cockpit, Swimming platform. 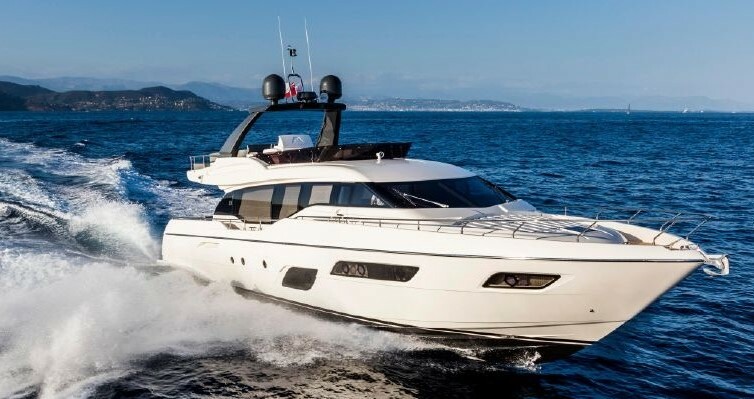 The Ferretti 881 HT– one of the most beautiful, with timeless high-speed motor yachts. Every where you look you will be surprised by the attention to detail. The helms position is well forward to create a large living area saloon, there is the wide beam to create generous width. She has comfortable living area inside, and a world-class flying bridge for entertaining, plus a huge water sports activity area on the stern. Externally a very large flying bridge, provided with a Jacuzzi, hard top and sofas, makes this area the ideal place for sharing unforgettable moments with the guests. There are two huge sun pads on the bridge, seating for at least 12, a secondary helm complete with retractable instrument panel, a mini galley complete with fridge, stove top, sink and serving bar –plus, the centerpiece for entertaining: a large hot tub with Jacuzzi. The generous salon with leather sofas and an ample central table reveals design and practicality.Throughout, there is the highly lacquered cherry interior. this warm cherry has been the classic and adds to elegance. the cherry paneling and furniture have a pale finish, and produce a light, soft interior, which matches well with the tan leather and cream-colored, coarse-woven fabric on the walls; thin horizontal wood strips break up the paneling. This rich simplicity creates what is one of the best and most restful interiors. A large garage located aft, with an hydraulic opening, folds out producing a 90-square foot platform extending out over the water. Not only can this be used for swimming, diving and sun bathing, but we also have this as a handy dock for the inflatable, jet ski, kayak, or other water toys. The interiors spaces and finishing made this yacht a real villa on the sea. SYS Yacht Sales is pleased to assist you in the purchase of this vessel. This boat is centrally listed by Marine Solutions.